of our America's Boating Courses beginning in April. WHAT IS THE UNITED STATES POWER SQUADRONS®? The United States Power Squadrons® is a national nonprofit boating organization with over 40,000 members in 450 squadrons across the country. Founded in 1914, it is America's largest educational boating organization dedicated to making boating safer and more enjoyable by teaching classes in seamanship, navigation and related subjects. Our members are boating families like yours who contribute to their communities by promoting safe boating through education. The Norwalk Sail & Power Squadron is a part of this national boating safety educational organization. We have fun, we offer boating-related educational courses, and we do civic service. To find out more about the purpose of our organization, click here. If you want to find others who share your love of boating, if you want to boost your boating skills and confidence, if you want to share good, wholesome family boating fun with others, look no further. You have found your new boating club! The Norwalk Sail & Power Squadron has both on and off-water family-oriented social activities — and courses in seamanship, navigation, sail, weather, engine maintenance, and many other boat-related subjects. We invite you to take courses with our squadron, and, if you'd like, become a part of an organization that shares your love of boating and the water. Welcome to the Norwalk Sail & Power Squadron. This year we've planned numerous events ranging from dynamic speakers, our annual picnic, on-the-water events like our annual raft-up and the Norwalk harbor tour, as well as our safe boating Courses, Vessel Safety Checks, advanced courses, our holiday party and more! We’re working hard to offer the kinds of activities that you and your family will enjoy as well as opportunities for you to give back to your community and fellow boaters. We look forward to having you join us. The initials after the members' names indicate the level of coursework attained. The letters come from the names of the courses and are taken in order â€” Seamanship, Piloting, Advanced Piloting, Junior Navigation, (Senior) Navigation. 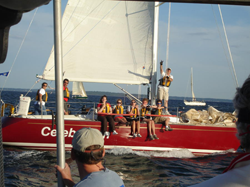 For an explanation of what the courses cover, visit our Boating Classes page. We are a non-profit boating safety education organization dedicated to enthusiastically sharing nautical knowledge. Check out these pages, then email our commander with any questions. We look forward to having you and your family learn with us. 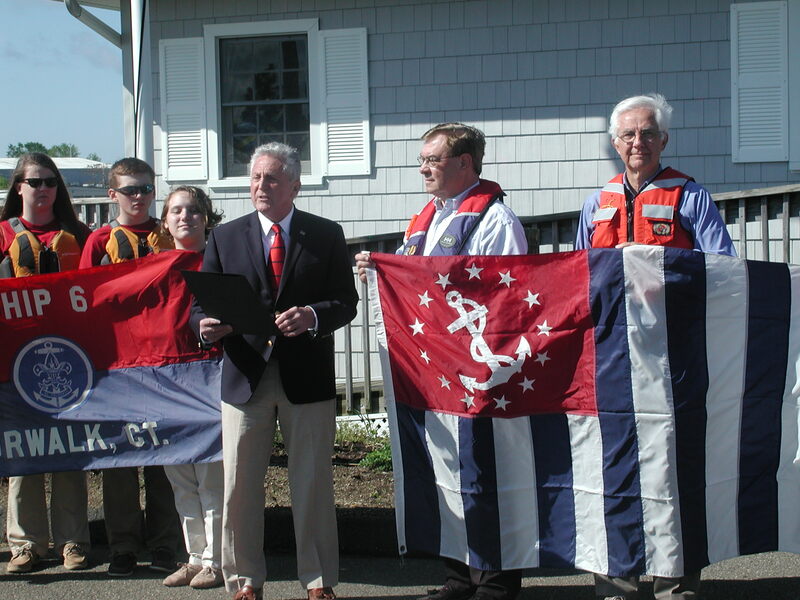 Safe Boating Week ceremony at Norwalk's town docks. Norwalk Sail & Power Squadron is honored to have received the 2018 Distinctive Communicator Website Award.